Hey, Maker Friend! I see you there….working hard on your business – creating products, watching trends, getting your name out there. You’re rocking it (or maybe you’re not now, but you will)! I want you to put your hook down for a second and be honest with me. Tell me, have you ever, somewhere in your heart-of-hearts, questioned if it were truly possible to make a ‘real’ income with your crochet business? I am, so often, asked by crocheters and designers alike if it is really possible to make a full-time income with crochet. But yes! Yes, you can make a full-time income with crochet! So, what I already know about you, is that you’re not afraid of hard work, you understand that money won’t fall from the sky and that it’s going to take some time to build a business….but diversification? I can hear you questioning it already. You just want to make pretty things, right? But, just think about it, have you ever really considered diversifying your revenue streams to really explode your business? I just don’t want you to put all your eggs in that one little basket and hope for the best. By creating a variety of income channels, you have a greater chance of success. If you haven’t already checked it out, head on over to my post 20+ Ways to Make Money with Your Awesome Crochet Skills to see all the many ways you can spread the reach of your business. In that article, I mention that one way you can make money with your crochet skills is through starting a blog for your crochet business – and that’s where I want to focus today. (b) nothing makes me happier than helping others create a life they love. As a psychotherapist, I knew (b) already, but it was solidified even more in December of 2016 when so many women wrote me letters of thanks for “saving Christmas,” “saving our car from repossession,” and “saving our home from foreclosure.” These women had used my profit-optimized Messy Bun Hat pattern and seen their businesses soar and I realized that’s the direction I wanted to take my crochet business – helping others to create the business they love…and what better way to do that than through starting a crochet blog and, eventually, building that into an entire learning-community of crochet business owners? Sure, if I had dreamed of scaling my business, hiring crocheters to mass produce product, and really grow the retail side of my business, I could have done that. But that’s not me. That’s not where my heart is. Yes, I love to sell hats that make women feel beautiful and I love designing products that my customers love…but I never wanted to grow that side of the business to anything much larger than it already was. So…blogging! 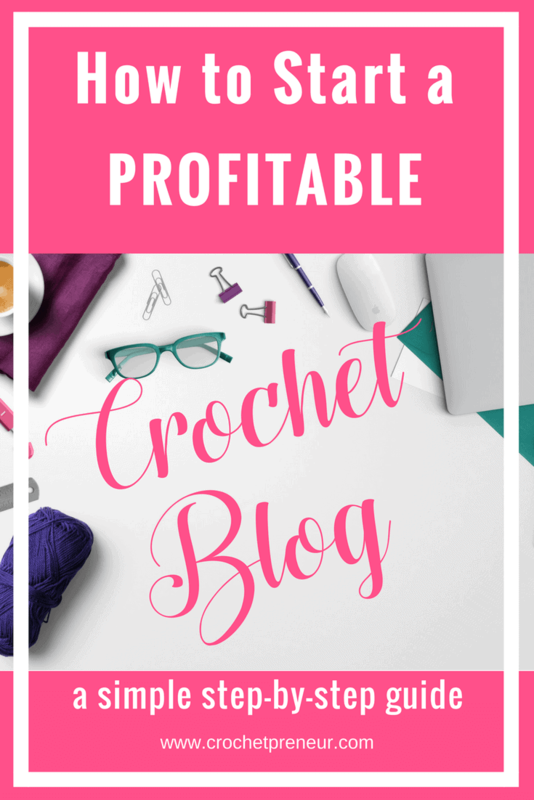 I decided to start blogging about the crochet business in order to share the lessons I learned while building a successful products-based business, to spread the word about profit-optimization in product-line design, and to help other women succeed. That’s my WHY….why I blog, why I get out of bed excited every day, and why I’m writing this post – to help you succeed. And I encourage you to blog because I believe, through blogging, you can further solidify your chances of creating a profitable crochet business. Not only does a blog bring exposure and opportunities to connect with production partners and customers – helping you fulfill YOUR why – but the blog, itself, can be a source of income through advertising, affiliate sales, sponsored posts, and product sales. And the great thing is that the blogging world needs you – it needs your voice, your ideas, your energy! It doesn’t matter that there are all kinds of maker blogs out there…none is exactly like the one you’ll create. You are a missing piece. Isn’t that exciting?! The possibilities are as endless as your imagination – your blog can be about so much more than just crochet, even. Go ahead….dream, figure out your why, and use our blog as a means to reach out and create your future. Yes? Great! Let’s go build your crochet blog! Now, I’m no technological genius, but I’ve been able to do almost everything on my blog by myself. So, that means it’s not going to be too tough for you to get started, either. And I’m going to walk you through just how to do it the same way I’ve done it. Ready? While many hobby bloggers will use a free site like blogger.com or wordpress.com to host their blog, if you’re going to be using the blog to make income (and you are, right? ), you’ll save yourself a lot of trouble by just starting on wordpress.org with a self-hosted site. I did a lot of research before starting my blog and, finally settled on Siteground as my hosting provider. I read many reviews lauding SiteGround’s incredible customer service, reliable up-time, and site speed – all of which were very important to me. So, I decided to go with them and I haven’t been disappointed. Since that’s what I use, that’s what I’ll walk you through to set up your own site. To start, click here to open a new tab and let’s work through this together. OK, now that we’ve headed over to SiteGround, we need to select a hosting plan. At this point, you’re just starting out, select whatever plan you feel is most cost-effective. I started with the GrowBig plan and, after 8 months, I’m getting over 25,000 visits a month so I’m ready to upgrade to GoGeek. Don’t let this step trip you up. Just select whatever you feel fits your business best and you can upgrade later. SiteGround makes procuring a domain name so easy! The option is included right along with your setup. The domain name is the URL your readers will use to find your site. Ideally, your domain name will match your business name or your personal name. Sometimes that doesn’t work. Just do your best – you can always change the domain name if you find it doesn’t work for your purposes. *While there are several options to select a .net, .co. or one of several other extensions, I recommend finding a domain name with which you can use .com, because no matter how many times you tell your readers it is something else, they will always type in .com when looking for you. If you already have a domain name, you can still host your blog on SiteGround. Simply “I already have a domain,” and proceed from there. You can, also, transfer your domain from its current provider to SiteGround if you prefer. Create your account as you enter your username and password, fill out your contact info and payment details. Then, select your hosting period. Then, select “Domain Privacy.” While this is optional, for only $12/year, you protect your private information from being publically listed as the owner of the site. It’s totally worth it. I told you SiteGround’s support team is great – they’ll install your WordPress for free. After you sign up for SiteGround hosting, log into your account and select the “Support” tab. YOU DID IT! You are an official Crochet Website Owner! Remember, everything you see will be the theme’s default info – content, photos, etc. You’ll want to take some time to play around with those options and make the site YOURS. Then, start customizing your site by going to “Appearance,” “Settings,” and “Customize” to get it looking the way you’d like. Again, everything here can be changed later, so don’t let it stress you out. Down the road, if you have any trouble, you can contact the theme’s designer. They’re typically very quick and happy to help. Take some time, figure out how you want your blog to look, write your “About” page and figure out who you’re writing to….this will be you’re customers, right?! Have you figured out who your customers are yet? Once you determine who your ideal customer is, decide what her pain points are and how you can help her. Then, create content that speaks to those felt needs by clicking “Posts” and “Add New Post” in your dashboard. Write a post, publish it, and you’ll be golden! Do you see how easy that was? Now, you are on your way to diversifying your business’ reach, creating yet another income stream, and garnering the income you desire from your crochet business. Don’t worry about creating content every week for now…just work on finding your audience and your voice. We’ll work on the rest soon. Remember, this is the foundation for everything that comes next like refining your voice and monetizing your blog for profitability. I hope you found this guide on how to start a crochet blog on SiteGround super helpful. Please, comment below and let us know the name of your new site! I already have the free wordpress blog. Will the results be the same if I just use the wordpress paid package? At least for starters? Thanks Pam, good to know it’d be an easy transition when needed. Hi Pam. I wanted to ask if you could recommend a website that I could use to create my logo. This is where I’m kinda stuck because graphic design isn’t my forte. You can always start with Fiverr, if you looking forward something super affordable. If you’re looking for something a little more unique and customized, I’d suggest you look at graphic designers on Etsy. There are several that produce “off the shelf” logos that you can purchase a sole-use license for. This way you get something unique without having to pay big bucks. Then, there are also Etsy designers who will do custom work for you. Take a look around, I’m sure you’ll find someone to make you just what you need. I hope this helps! Thank you for this … I’ve been on the fence for years about starting a blog! Very good resource.